Years ago I did production work for a jeweler lady who was very popular with men. One of her many admirers who used to come by the shop (garage, actually) was Todd. Unlike the other guys, Todd was an enthusiastic and talented chef, making classic recipes from his Italian family, which he knew by heart. One summer day he started talking excitedly about basil from the Farmers Market, ecstatic that it was the season to make pesto. I asked for his recipe, which he dictated on the spot and I scribbled down on a used earring card. I made the recipe numerous times, until I could barely read it. Then I lost track of the old card till it miraculously resurfaced a few years ago and I copied it into my recipe binder. I hadn’t made it again until tonight. Indeed, it’s a classic. Of course, leave it to me to tweak a classic recipe. 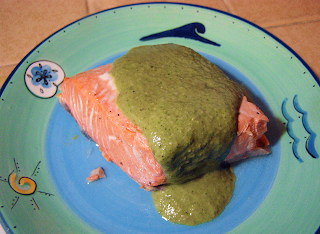 I wanted to make a lighter pesto with less oil, so substituted water for 1/2 of the olive oil. This was quite good with sustainably caught salmon, but I might choose to replace only 1/3 of the olive oil if I were topping something plainer like pasta. The water makes the pesto a bit thinner in texture. This pesto recipe is delicious on top of tomatoes. In fact, while raw garlic does not seem conducive to romance, I had quite a bit of luck in the old days charming suitors at casual dinners with Todd’s pesto, pasta, and sliced garden tomatoes. 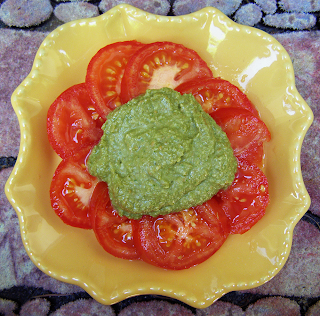 Simple, economical, and colorful, perhaps I’ll try this idea again with hubby Bruce when our tomatoes are finally in season. Using an immersion blender makes preparation even simpler, and clean-up a breeze. 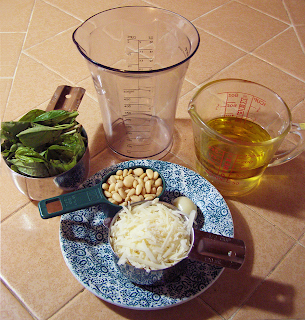 Put pine nuts, olive oil, water if using, garlic, and 1/3 of the basil leaves in the blender (or immersion blender container) and puree. Add the remainder of the basil leaves, a little at a time if needed to keep blender from bogging down. Add parmesan cheese and puree till smooth. Serve as topping for pasta, salmon, tomatoes, pizza, chicken, or whatever else you like!